The jury nominated 10 projects for the Reynaers Project prize 2018 including Victoria Court. The public decides the winner. Please vote for Victoria Court on the website of Reynaers. 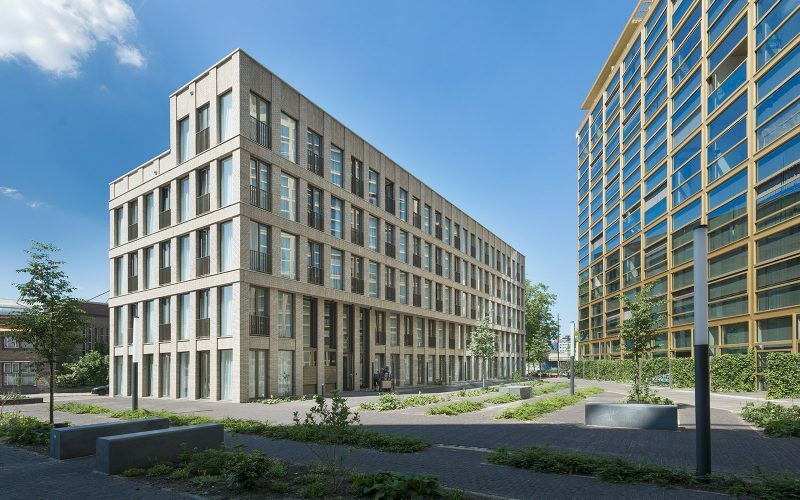 The residential block Victoria Court forms part of the transformation of the Emmasingel quadrant in the city centre of Eindhoven. Victoria Court has been completed in March 2018. 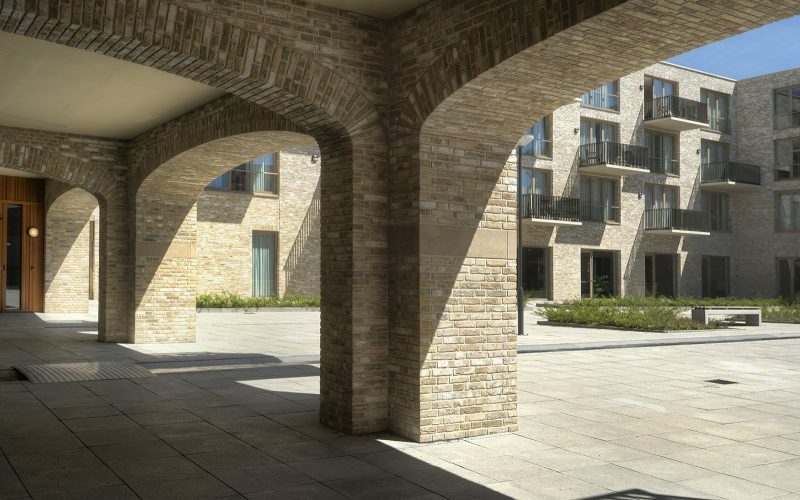 The Victoria Court program compromises 43 apartments with commercial space in the plinth. The urban development plan for this project was designed by West 8. Diederendirrix is also involved here on other architectural projects, including Philips Lighting and the Onyx residential building. More information about this project and the nomination on Reynaers Project prize. Check out the project video of Victoria Court on Youtube. 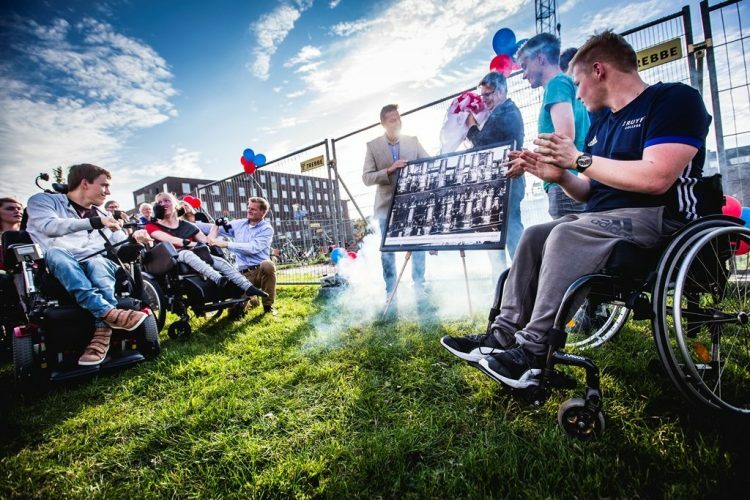 Client Nijestee has started the construction of a fourth residential block in the Gruno district in Groningen: Lampisterie. 101 social housing units will be built in the building, including 15 homes for young people with a physical disability. On Tuesday 16 October, the official start of the construction took place in the presence of a number of future residents, stakeholders, local residents and alderman Roeland van der Schaaf. Lampisterie comes between the Paterswoldseweg and the Grunostraat. In the building there will be two, three and four-room apartments, maisonettes and apartments for young people with physical disabilities, together with a common room and a space for the care provider. All apartments are covered by social rent. Diederendirrix has designed all homes to be earthquake-resistant, energy-efficient and gas-free. The design of the building also takes into account the housing of animals: forty nest boxes for common swifts, fourteen for house sparrows and fifteen for bats. The official start of the construction was accompanied by the unveiling of a canvas with an image of a lampisterie, the place where (train) lamps used to be kept, cleaned, filled and take out. The canvas is a gift to the future residents and is given a central place in the building. All names of the new residential buildings in the Gruno district have a link with trains. In the past, railway employees used to live in the neighborhood. On Friday 24 August 2018 diederendirrix organised a guided tour of the building previously occupied by the Technische Dienst in Eindhoven. The TD building is currently being transformed into a residential development, comprising 157 residential units, a restaurant and office space. The conversion is in full swing and this was indeed an excellent opportunity to invite a number of our contacts and a group from the municipality of Eindhoven to join the tour. Completion is close! 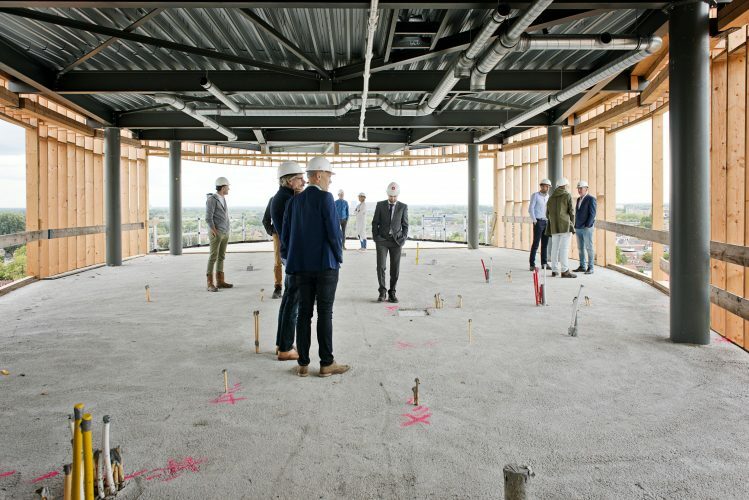 At 3.30 p.m. Dirk Vervoordeldonk, construction supervisor at Stam + De Koning, welcomed the group on the construction site. Paul Diederen gave a brief presentation and afterwards the group visited a number of floors. The enormous penthouse on the 11th floor has a stunning view over Eindhoven. This also applies to the other floors. The tour concluded with drinks at the neighbouring Stads café/restaurant. For more information see project. Following the successful Archicups in the Randstad urban conurbation, it was high time that this event was also held in Eindhoven, according to Christopher Ho (diederendirrix architectuur & stedenbouw) and Theo van Hoeve (Pauwert Architectuur). With no fewer than twelve competing teams comprising Eindhoven and/or Brabant based architects, this first event was a great success. 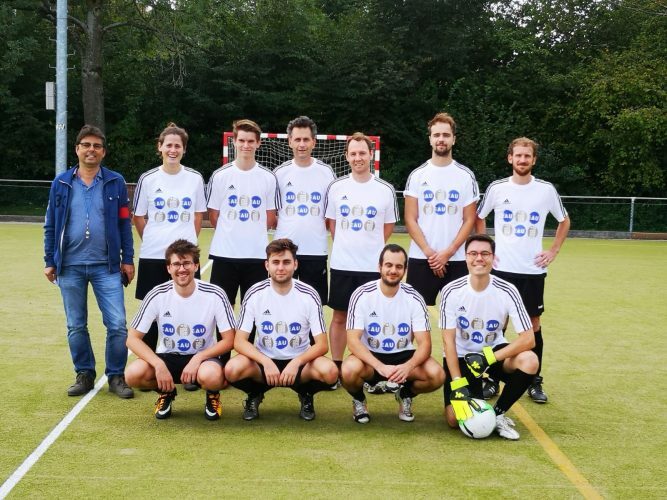 The teams assembled on Thursday 30 August at the students’ sports centre at TU/e where the players kicked off at 3.30 p.m. The teams were divided into pools with each team playing a minimum of two matches. The winning team in each pool went through to the semi-finals. The teams were spurred on by colleagues, family and friends. The teams fought hard for the coveted trophy in this first event! Finally, following a thrilling contest, Architect Direct from Mierlo went home with the cup. In the semi-final diederendirrix played against Houben from Mierlo. diederendirrix was really strong, and won by 2 – 0. In the other semi-final Architect Direct beat Inbo. The final kicked off was at 7.30 p.m. and the younger team, Architect Direct proved too strong for diederendirrix with 5-0. The winner triumphantly received the first trophy cup, as well as the Fatboy Lamzac.This event was made possible in part by: TU/Eindhoven, the organisation (Christopher Ho and Theo van Hoeve) and principal sponsor Fatboy Lamzac. It was an entertaining, sunny and sport-filled day and after the football there was of course no lack of food, drinks and music. Participating teams: Van Aken – cae, Houben / Van Mierlo, Buro Lubbers, Bouwhulpgroep, Inbo, BEVER, Architect Direct, KAW, De Twee Snoeken, Pauwert Architectuur and diederendirrix/bureauEAU and the combi-team. The Keilecollectief, in collaboration with diederendirrix, organised a workshop on the (circular) area development of Merwe-Vierhavens, for the Rotterdam International Architecture Biennale. Part of the afternoon comprised a guided tour of the Lee Towers – the former Europoint Towers II and III − that are being transformed from offices into accommodation and catering facilities. Following a brief introduction by Paul Diederen, two groups in succession toured the buildings with project architect Bram van Ekeren and project manager Michael Louter. The groups visited a stripped office level, a completed accommodation level and the still empty upper floors in tower III.The view and the new sliding windows made a deep impression. The restaurant in the upper level can also count on a great deal of enthusiasm. The afternoon concluded with drinks at Uit je eigen stad, the urban farm on the adjacent docks. The presentation took place on Wednesday 27 June 2018 in De Caballero Fabriek in The Hague. Kloostertuin Brakkenstein won the Gulden Feniks in the Area Transformation category. The diederendirrix design team (residential buildings), EVA architecten (the Drukkerij premises) and Kees Tolk (landscape), were responsible for the transformation of the monastery complex in Nijmegen. 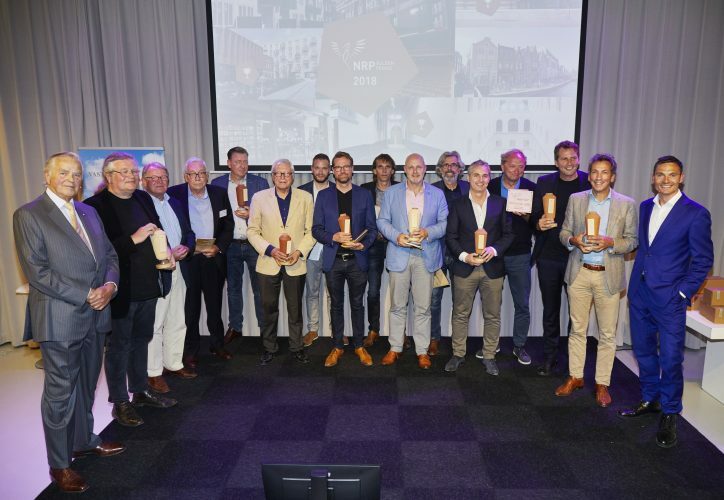 Winners in the other categories are Musis Sacrum, Arnhem, in the field of Renovation and Blokhuispoort, Leeuwarden, in the field of Transformation. The jury’s comment about the project: “The Kloostertuin in Nijmegen is an inspiring example of how, with private assets, inspiration and long-term vision, you can make a valuable contribution to society”. This year, the NRP Golden Phoenix jury has nominated 7 projects out of 65 submissions for the much-coveted NRP Golden Phoenix awards. All nominated projects demonstrate the unique potential and broad diversity of functionality that existing properties have to offer. On Wednesday 27 June in the Caballero Factory in The Hague the winners will be announced and the awards will be festively presented. Kloostertuin Brakkenstein (Brakkenstein Monastery, Nijmegen), together with Aalmarkt (Leiden) has been nominated in the Area Transformation category. Kloostertuin Brakkenstein comprises the ensemble of the Sacrament Church, Aquaviva, the Park building, the Drukkerij printing premises and the monastery garden. The overall plan was created by a design team, with diederendirrix being responsible for the church and the residential building, EVA architecten for the Drukkerij, and Kees Tolk for the garden design. Architecture builds upon history. Even the avant-gardist creed to ‘make it new’ still assumes a past. It is impossible to imagine novelty without an awareness of what existed before. In their transformation projects, diederendirrix retell stories of buildings and sites- by paraphrasing parts of the story, by recasting central actors, by making architecture speak in other words. By doing that, they make it anew. In their transformation projects diederendirrix re-tell stories about buildings and locations. By paraphrasing parts of the story, by repositioning key factors and speaking about architecture using different words, they make it anew. 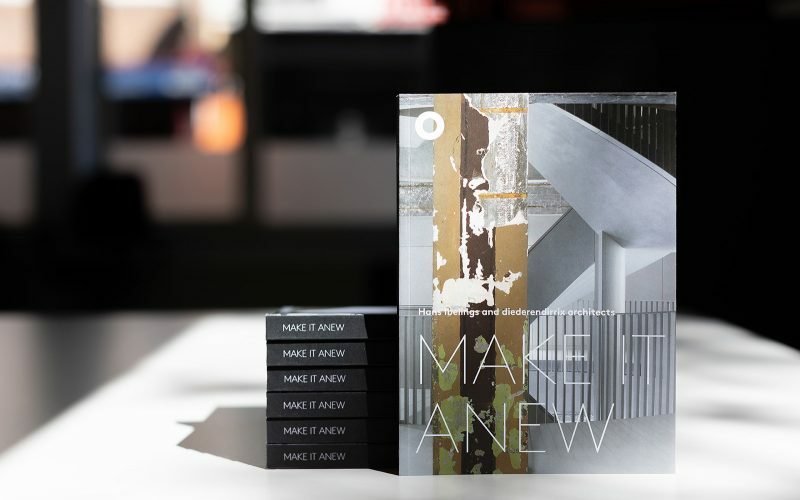 In the new publication Make it Anew, Paul Diederen and Bert Dirrix, together with Hans Ibelings, describe the work process of the bureau during the renovation, regeneration, restructuring and repurposing of existing buildings. On Friday 1 June, during the festive book presentation, the first copy will be handed to Government Architect Floris Alkemade at Kazerne in Eindhoven. 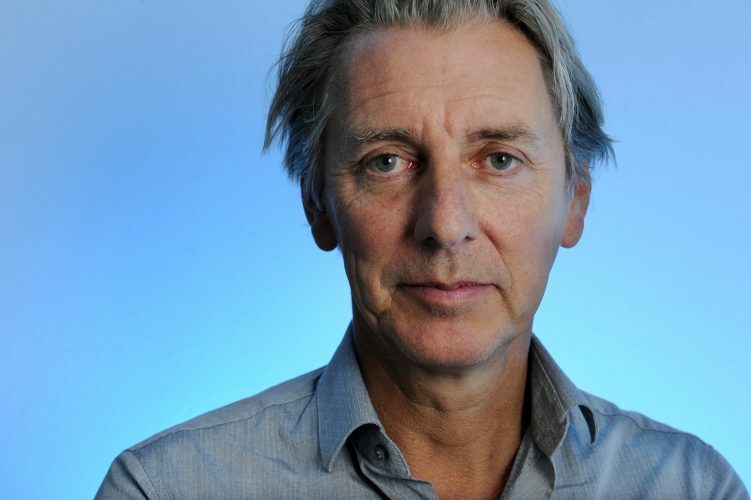 On 1 June 2016, Professor Paul Diederen was appointed as part-time Professor of Transformational Design at the Architectural Urban Design & Engineering Department of the Faculty of Building at the Eindhoven University of Technology. On Friday 1 June 2018 he will give his inaugural speech, entitled ‘Designing change/The Design of change/Designing for change’. The future of the city already exists. It is the city in which we are currently living, learning, working and playing. The innovation of this city requires a nuanced framework of ideas and practical approach. The shock doctrine of tabula rasa is replaced by an adaptive city. Renovation, conversion and the re-use of the existing building stock and the further densification of the city is a continuous process in this approach. In his inaugural speech Paul Diederen talks about what inspires him as an architect. He describes his vision for the re-use of the post-war construction environment and outlines the spearhead of his research and teaching: how the strength of the existing context is the guide to a new future. On Friday 9 March 2018 during an official press meeting the spokesperson announced that diederendirrix will design the expansion of the NIEUWE NOR pop venue. The expansion includes a new hall that will soon accommodate some 700 visitors to pop concerts, dance events and other performances. This so-called “central hall” complements the city’s existing club circuit and is an important new link in the transition of new local talent to increasingly large venues. 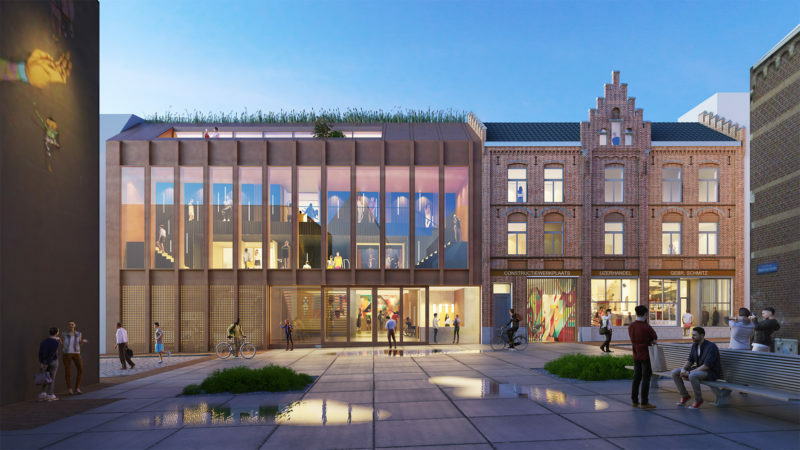 The new hall will be connected to the existing building by means of a new transparent foyer overlooking Schelmenhofje. By means of a shared, flexible cloakroom the individual spaces can be used both separately as well as in a festival configuration. The café functions as an independent unit. The upper floor of the existing building will be used as changing rooms and recreational/social amenities for artists and crew, deliveries are resolved internally. In the Nieuwe Nor the activities, dynamics and movements of the concert goers are visible from the street. It becomes a scintillating building and an exciting addition to the street scene, to the cultural experience, and to the city. The winning draft design was selected by a committee comprising the municipality of Heerlen, IBA Parkstad and the NIEUWE NOR pop venue. The design was chosen unanimously.